If you’re hoping to find a drinking guide to the British Virgin Islands (BVI), you’ll want to look elsewhere. Rather than rum drinks, my family and I were lured to the BVI by the promise of secluded harbors and untamed shores while on a power catamaran charter. And if we could get stung by jellyfish (multiple times), step on cacti, and eat nothing but frozen pizza for a week and still consider this the best vacation we’ve ever had, than you know this place is pretty special. We began our journey on Tortola, the largest of more than 60 islands that make up the BVI; only about 15 of which are inhabited. Six of us, my boyfriend and I, my parents, and my brother and his girlfriend, would be cruising these islands for a week on the MarineMax 443 power catamaran, which is equipped with three cabins and three heads. For a family who likes its privacy, separate cabins for each couple were key. There was always a space, whether on the bridge, on deck, or down in the cabins where one of us could escape to if we were in need of some alone time. The next day we woke bright and early, provisioned the boat, and had breakfast at the marina before completing the charter briefing and setting off. A little nervously we threw off the lines, sailed away from the safe harbor, and watched the base slip into the distance behind us—nothing but white puffy clouds, green hills, and a vast blue ocean before us. 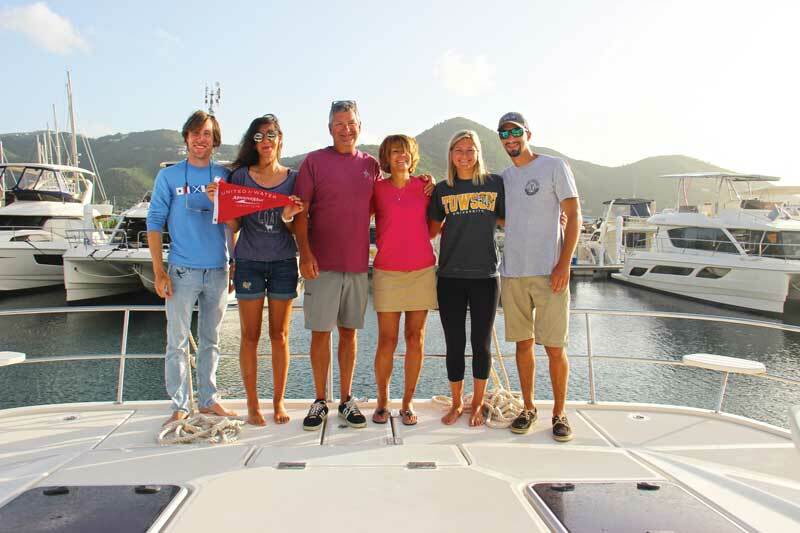 Our party of six proudly displaying the MarineMax Vacations burgee. Going into this we had no set plans. There were a few must-see places we each had on our list, but for the most part we let our whims guide us. Among the list of books we brought along was Robert Louis Stevenson’s “Treasure Island,” so when we heard rumor that a nearby island might have provided some inspiration for the book, we plotted a course straight away. Norman Island, sometimes referred to locally as Treasure Island, is just a short cruise across the Sir Francis Drake Channel from Nanny Cay. Upon entering the anchorage known as The Bight, the ghostly hulk of the legendary floating bar Willy T can be seen on shore where it was beached during Hurricane Irma. The Willy T has since found a new home in Great Harbour on Peter Island, so what is usually a crowded anchorage was pleasantly deserted. Luckily we didn’t come here for the bars; the real highlight of the island is the underwater caves at Treasure Point. Legend has it that around 1894, a fisherman took his small boat into the caves, seeking shelter from a storm. As the boat was repeatedly bashed by waves against the wall of the cave, several rocks were dislodged, along with several doubloons (Spanish gold coins). While the story has never been officially verified, the legend of buried treasure persists to this day. 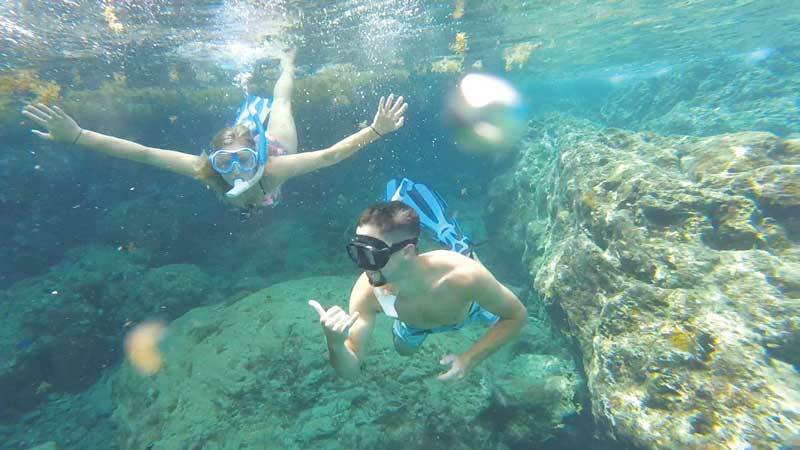 Snorkeling the underwater caves on Norman Island. Before departing for Cooper Island the next day, two of the more adventurous in our party hiked to the top of Spyglass Hill. Looking up at them through binoculars it wasn’t too much of a stretch to imagine a spyglass in their hands and scabbards on their hips, the line from “Treasure Island” ringing out, “Hang the treasure! It’s the glory of the sea that has turned my head” as they raced down the hill and back to the ship. It’s funny, looking back, how the place you’re most excited about can sometimes turn out a little differently than envisioned. That’s how The Baths were for us. 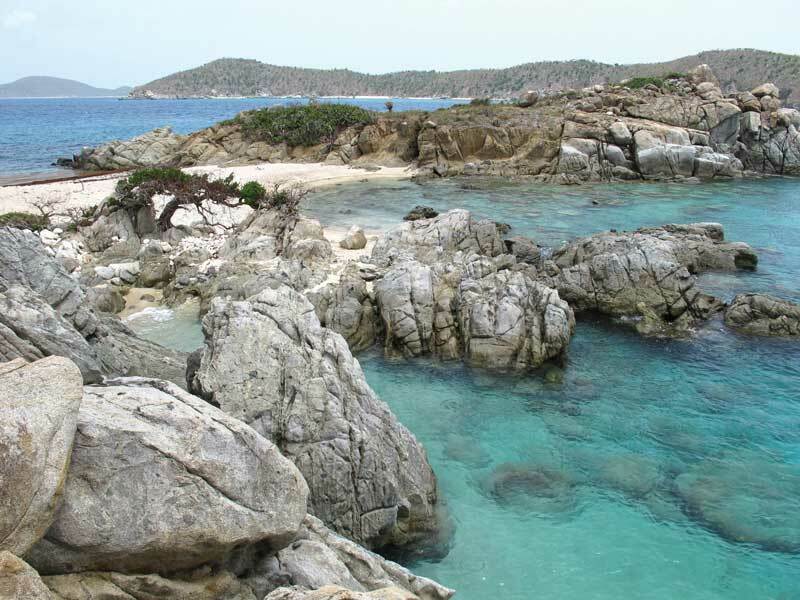 The Baths National Park are a dramatic area on Virgin Gorda’s north shore, comprised of towering boulders and sheltered sea pools on the beach’s edge. The morning we set out we woke up at dawn on Cooper Island and made a beeline for Virgin Gorda, arriving at The Baths just after sunup. This is a very popular spot, so we were amazed to find the mooring field empty when we arrived. From the Baths, there is an otherworldly trail through the boulders that will take you to a pristine white sand beach and sheltered swimming cove known as Devil’s Bay. There was not a soul on that beach but us. But as one person got stung by a jellyfish, and then another, we began to see why. The water was so beautiful, it was nearly impossible to stay out of it, even with the threat of jellyfish. When I got stung the fifth time, however, the blue water lost some of its appeal. Luckily some more prepared visitors arrived with a gallon jug of vinegar which they proceeded to douse me with as if they were putting out a flame. When we got back to the boat we began researching jellyfish in the BVI and learned the culprit was most likely a Sea Wasp, a box jellyfish with an extremely potent and painful sting. Symptoms include severe lower back pain, limb cramping, nausea, headache, restlessness, and “a feeling of impending doom…” After five stings I (overdramatically) thought I was dying. But once we pulled away from jellyfish territory and the antihistamine finally kicked in, my sense of impending doom abated and I was ready to continue exploring. Thanks to those jellies, we ended up spending the least amount of time at the place we had been looking forward to the most; which just goes to show that no cruising plans should be set in stone. After tending to our wounds back on the boat, we cruised north to Prickly Pear Island, part of the BVI National Park System, and the next day to the Dog Islands. These spots were some of my favorite destinations on the trip. Everyone dreams of having a deserted island all to themselves, but how many people actually get to experience that? Just keep in mind, it can be hard to re-provision on uninhabited islands, so prepare for that or you’ll end up eating a lot of frozen pizza and hot dogs (like us). Upon arriving at Prickly Pear, the island had a bit of an eerie feel to it. The Sandbox Beach Bar and Grill had been reduced to rubble during the hurricanes. Ghostly lawn chairs and high-top tables still littered the beach. The only other inhabitants we saw were a band of roving goats, which led us to a high bluff overlooking Richard Branson’s Necker Island. While following the goats, however, we discovered how the island got its name—its hills are covered with prickly pear cactus, so make sure to bring sturdy hiking shoes. With no schedule to keep to we could lounge on the beach to our heart’s desire and fall asleep when the sun went down. Since most of the beach bars we happened upon were closed, or worse, destroyed, there were very few late nights, no hangovers, and we were able to wake up each morning at dawn, bright eyed and bushy tailed. George Dog, one of the five uninhabited Dog Islands. The next day we opted to forgo Anegada Island, which everyone has since told us was a mistake, but it’s hard to have regrets when we visited so many other truly amazing places. We instead headed for the the Dog Islands before spending two days around Jost Van Dyke. The Dog Islands—Great Dog, George Dog, West Dog, East Seal Dog, and Little Seal Dog—are a small group of uninhabited islets northwest of Virgin Gorda. They are said to have received their names from sailors who heard barking when they moored there many years ago. What they assumed were dogs turned out to be seals, but the name stuck nonetheless. We spent the afternoon moored off George Dog, a 15-acre islet and the third largest of the five Dogs. We walked along the deserted, rocky shoreline, climbed atop boulders, and snorkeled off the beach. Like Prickly Pear, we had the entire shoreline to ourselves. 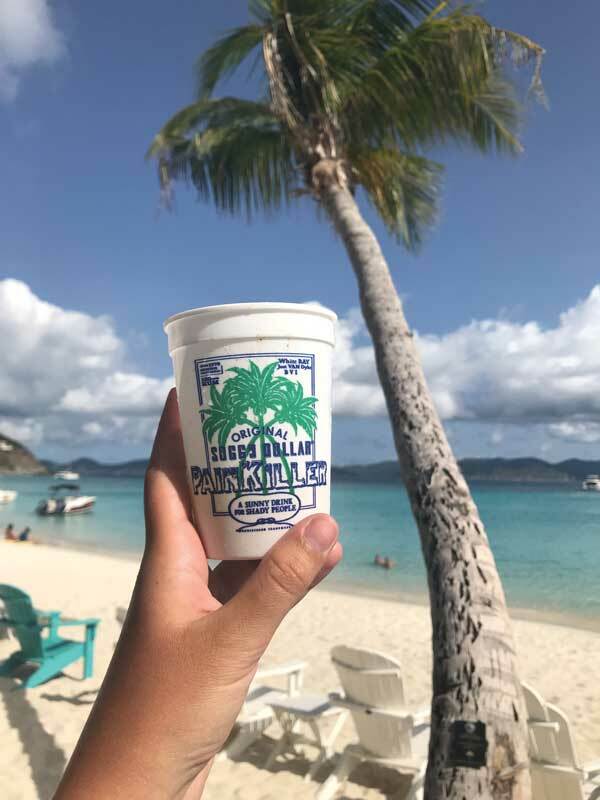 There was one beach bar on everyone’s list: the legendary Soggy Dollar Bar on Jost Van Dyke, home of the original Painkiller. So after departing from the Dogs, we began heading that way. 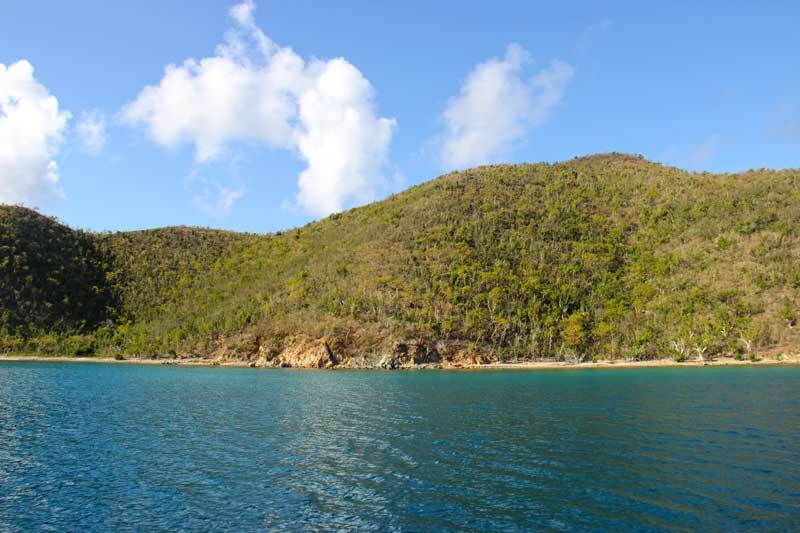 Our first stop off Jost Van Dyke was Sandy Spit, an uninhabited islet measuring less than half an acre in size that has been described as one of the most spectacular and remote beaches in the BVI. In photos pre-hurricane, it appears to be the perfect sandy beach with just a palm tree or two, surrounded by blue water. When we visited, the palm trees were gone, thanks to Irma, but a few baby palms had begun to sprout. The next morning we took our paddleboards and explored the grass beds between Jost Van Dyke and Little Jost Van Dyke before heading the short distance to Sandy Cay, a veritable tropical paradise comprised of 13 acres of sugary sand beaches, palm trees, hiking trails, high bluffs, and the bluest, clearest water I have ever seen. Once owned by the Laurance Rockefeller Estate, the island has since been transferred to the National Parks Trust of the Virgin Islands. We only visited one beach bar on our trip: the Soggy Dollar Bar. When we were sufficiently sunburnt for one day, it was off to White Bay and the Soggy Dollar Bar so we could finally see what all the fuss had been about. All I can say? The fuss was warranted and you simply have to try an island Painkiller for yourself. If you only go to one beach bar on your BVI trip, as we did (really, I swear), you can’t go wrong with the Soggy Dollar Bar. We hear Foxy’s is pretty special too, so we’ll put that on our list for next time. It’s very easy to lose track of time on a trip like this. I rarely had my phone on me, no watch, and time became inconsequential. So when the last day of the trip finally came around, it was pretty staggering. After living on island time for a week, it was hard to imagine having to go back to our schedules and hectic lives in the states. To make the most of our last day, we headed back towards Norman Island to snorkel the Indians, a small archipelago of uninhabited islets, made up of four rocky pinnacles shooting out of the water. The snorkeling here was unparalleled; sea fans and corals wave in the currents while schools of colorful fish dart through the passages between the rocks. We couldn’t have asked for a better place to end our trip. From there it was an easy, if somewhat somber cruise, back to the MarineMax base at Nanny Cay. The author at Sandy Cay. Looking back, it’s easy to feel as if we dreamt the whole thing. We had no plans, no schedules, nowhere to be. It was the type of trip we would have never thought possible; now we can’t imagine visiting the Caribbean any other way. The jellyfish scars will fade (eventually… hopefully? ), but the memories never will. For part one in our Power Charter series, click to How to Plan Your First Power Catamaran Charter, and for more information on our charter experience, click to MarineMax Vacations.